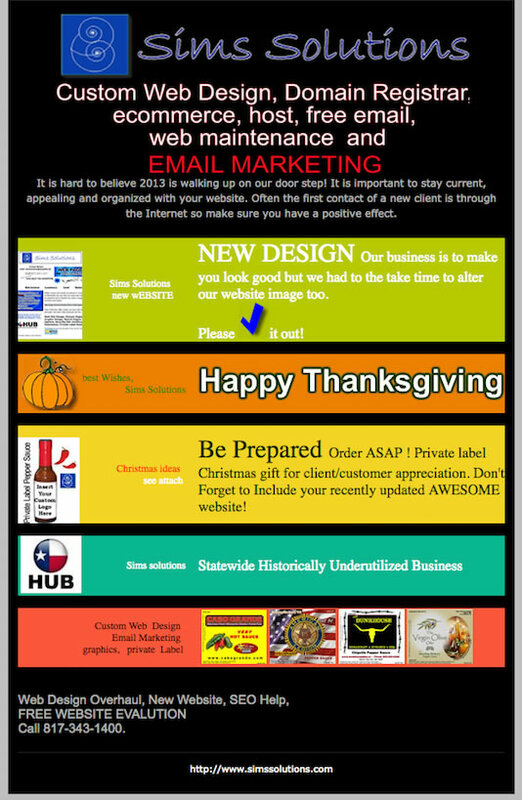 Email Marketing can have its Advantages. The element of surprise or "planting a seed" is a true way to Interaction BUT realisticlly people (consumers and the business owners) know what they want and when the want it. That is the case regarding Email Marketing because the fact is Email Marketing is Spam BUT Desired or Planned Spam can be advantagous for business. If you have a target list of potential clients then "Yes" Email marketing can potentially provide a good lead. Email Marketing is not expensive and can be used as a tool for business growth. Email Marketing can also be used as a tool on your website or email in finding out what your customers or client audience is interested in, for example, click to join our Mailing List. Many email carriers, business's and home computers have firewalls that block Email Marketing but this can be avoided with the aid of 1) consumer knowledge and 2) the way the email is sent. Sims Solutions offers a Mailing List option. If you elect to be notified we will use this list to Notify our Clients of Website Related Important Updates or Sims Solutions Updates (Maximum 4 a year). Your information will not be abused. Click the "Subscribe Tab" on the left to be notified of Sims Solutions Important Website Notifications. This subscription tab is a legitamate option but also shows the capabilities for the benefit of your potential clients. There are several ways of implementing this service on your website or within your out-going emails. Email Marketing is not expensive and be used as a tool for business growth.